Living in tune with the seasons has always had a sense of romance to me. 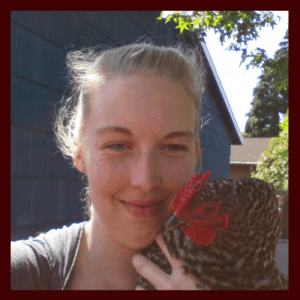 Even before beginning the backyard farming adventure I always tried to mentally mark the passing of the seasons, but I wasn’t sure how to incorporate that acknowledgement into a more purposeful way of living. By being more aware with each passing season, I have been able to live in a way that has a rhythm that changes throughout the year. It doesn’t take much time or effort to live more seasonally! This may be the easiest and most popular way to appreciate the warmer months. Planting a garden is a great way to appreciate the tender new growth of spring, as it turns into the lush greenery of summer, and then slowly dies back in the fall until it’s time of rest throughout winter. Plus home grown fruits and vegetables taste much better than many store bought varieties! You don’t need a lot of space to plant a few growing things. My very first garden was a lavender and a few tomatoes on our apartment balcony. Don’t have a balcony? Try growing microgeens indoors! Use the sun as your guide. If it’s up early and goes to bed late, feel free to make the most of your days. But when the days start getting shorter and the nights longer, use that as a reminder to take time to rest. So often we try to power through our days without building in resting times. That’s okay for a season or two, but try to do it all year and you’ll burn out. If I’m tired and the sun is down, I try to hurry through the day’s work and get to bed early. It’s okay to be a little chilly in the winter. That makes it a great time to put on a sweater and have some hot chocolate in front of a fire. You don’t have to freeze, but it’s hard to appreciate seasonal fluctuations in a bubble of constant 72 degrees. Go down to 68 in the winter and save a little money at the same time. In the summer, we don’t use the air conditioner. That may not be possible in some climates, but turn it up a couple degrees and eat some ice cream! I’ve found that by appreciating the seasonal activities that are appropriate for the weather, I enjoy the variations much more. Some times of our lives are non stop, go go go. Other times we just want to curl up and read a book. Give yourself permission to stay home and cocoon for a while, especially in the winter. By spring time you’ll emerge like a butterfly, ready to tackle the busy-ness of the other seasons. Homesteading and gardening fit that pattern. Spring and summer are often a bustle of activity with new gardens and baby animals. As the summer winds down the harvest slacks off, until it’s more like a holding pattern over the winter. Enjoy that cycle! Need More Ideas on How to Live Seasonally? Check out The Fiercely D.I.Y. Guide to Seasonal Living! When I had the opportunity to review this guide I jumped at the chance. It seemed like just the tools I needed to better incorporate the passing of the seasons into my daily life. (I received a free copy of this e-book to review, however this does not influence my opinions, in fact, I decided to become an affiliate because I liked it so much.) 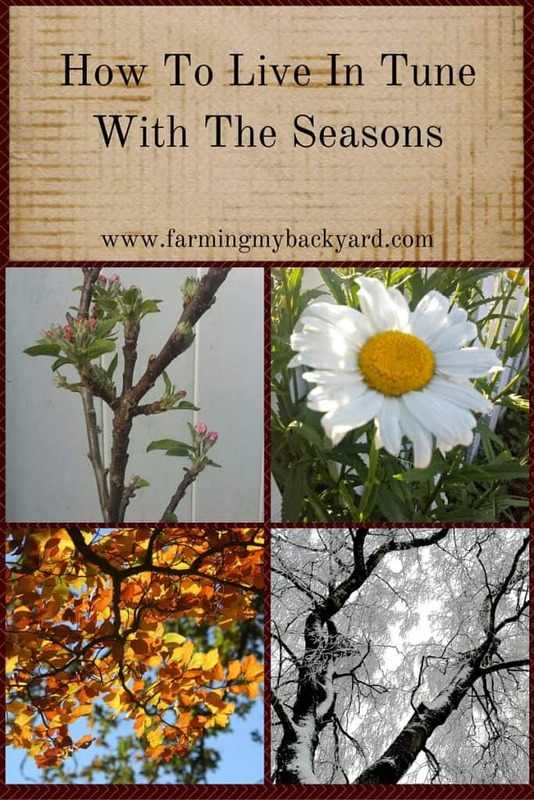 If you need more ideas on how to live more seasonally, I highly recommend this guide. The guide is divided into 12 sections, designed to be repeated with each season. The weekly suggestions can be as flexible as you need them to be, either sitting down once a week or spending a few minutes each day. For me this was a huge benefit in juggling the kids, animals, and work. One of the suggestions included in the guide is eating seasonally. Just a few years ago that was a very foreign concept to me. I didn’t even know when certain foods were IN season! After all, things seem always available at the grocery store. I had already begun changing my eating to be more in line with seasonal living when I read the workbook, but it helped give definition and ideas for me to continue on my path, and encouraged me to write down what I was noticing and living. Writing things down always helps them become a more integral part of me! There are really nice printable template to help get you started. A huge inspiration for me was the suggestions around creative seasonal grooves. I naturally find myself attracted to certain activities and crafts during certain seasons of the year, but after a while they sort of all started to bleed together. I found myself feeling guilty for wanting to make flower arrangements in summer instead of finishing up an afghan I had begun last winter. Now it was like I had permission to set aside one season’s activities to move onto another, all while knowing that the year would circle around and it would again be time for those creative endeavors that had been placed on pause. Not sure what might be a good project for you? The Seasonal Living guide includes seasonally inspired recipes and project ideas. The last lesson for each week of the season is planning for the season ahead. This was a great opportunity for me to slow down and think about my expectations before just charging ahead willy-nilly and realizing halfway through the next season that I was going to have a lot of unfilled plans. This time was super helpful for me to look back on the past 11 weeks and acknowledge all the things I did do, without focusing on the things that happened differently than I expected. By giving myself permission to be excited about the small seasonal changes I had made I was motivated to be more in tune seasonally for the upcoming season.